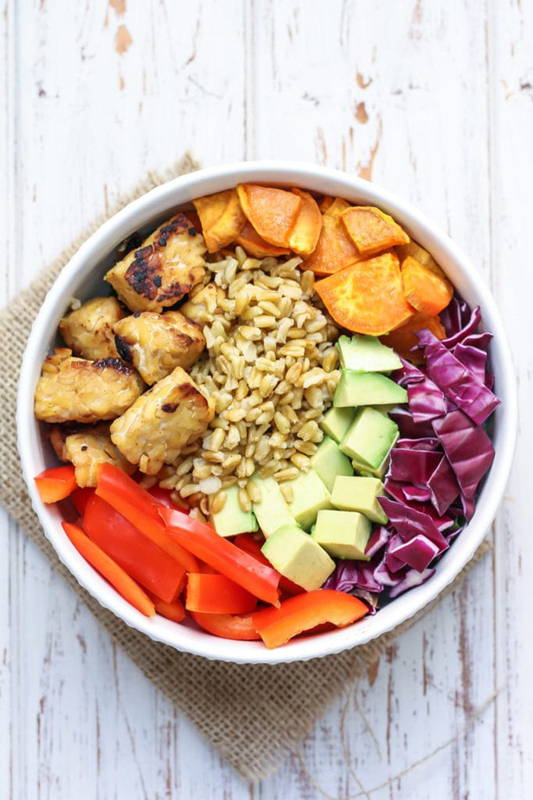 In case you’ve missed the hype about Buddha bowls, they’re colourful bowls of vegetables, grains, protein and other healthy foods. Once you see them, you’ll definitely want to try them! 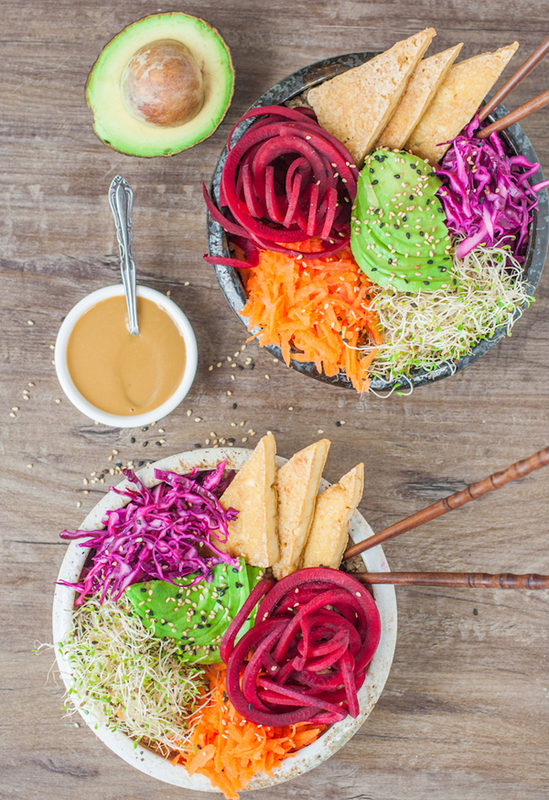 Buddha bowls are one of this year’s most popular food trends, most likely because they’re so easy to make at home! 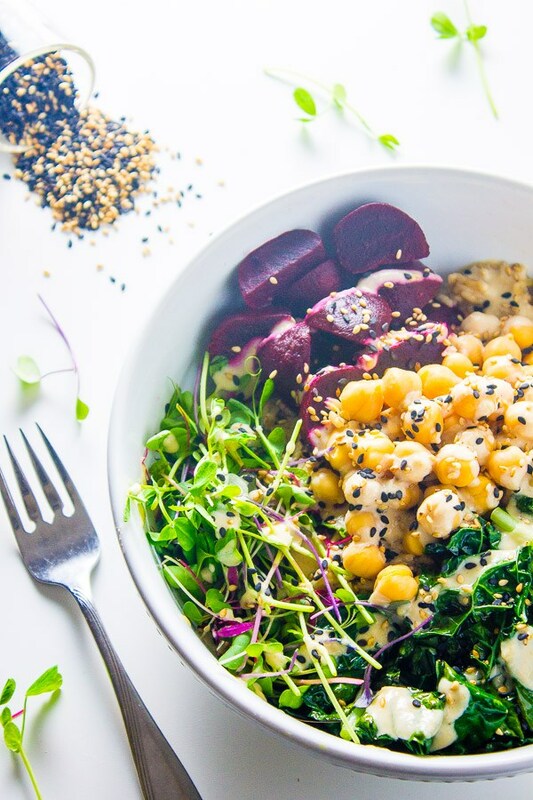 Take a look at our list of 20 amazing Buddha bowl recipes and be inspired. 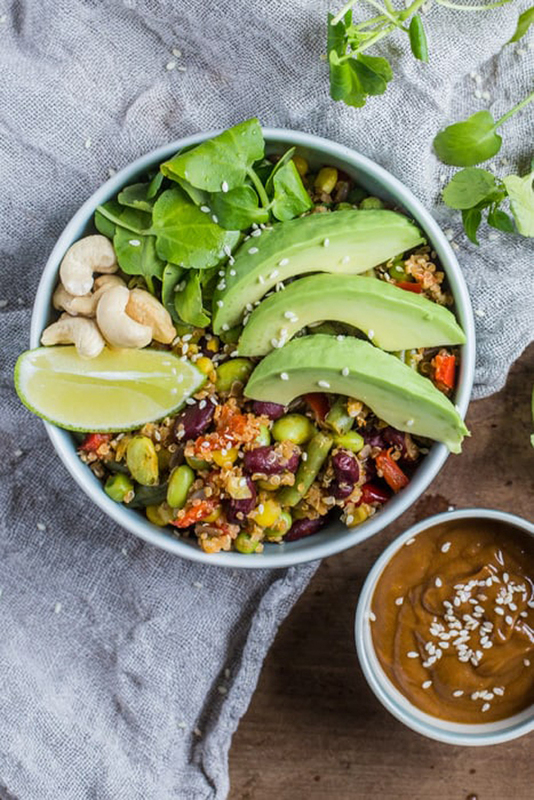 This is definitely a bowl of plant-based goodness! 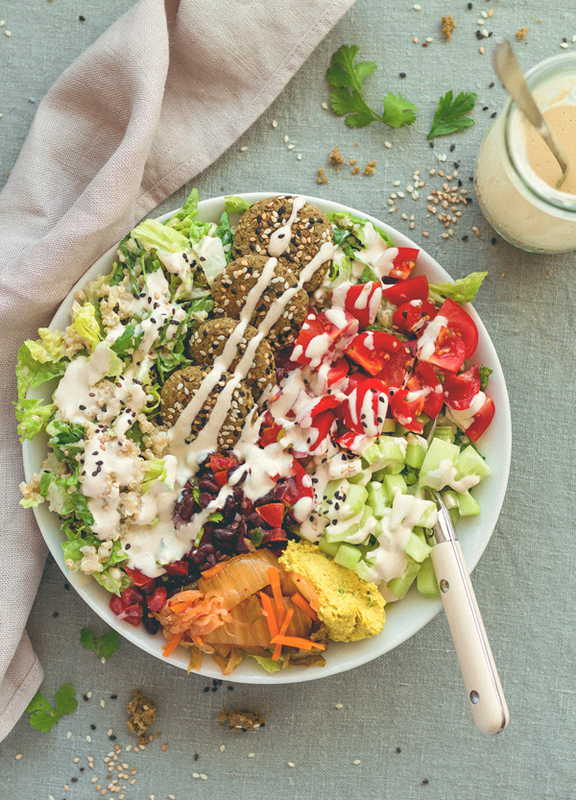 It takes just half an hour to put together and the maple-tahini sauce is apparently ‘so good you’ll want to put it on everything’. 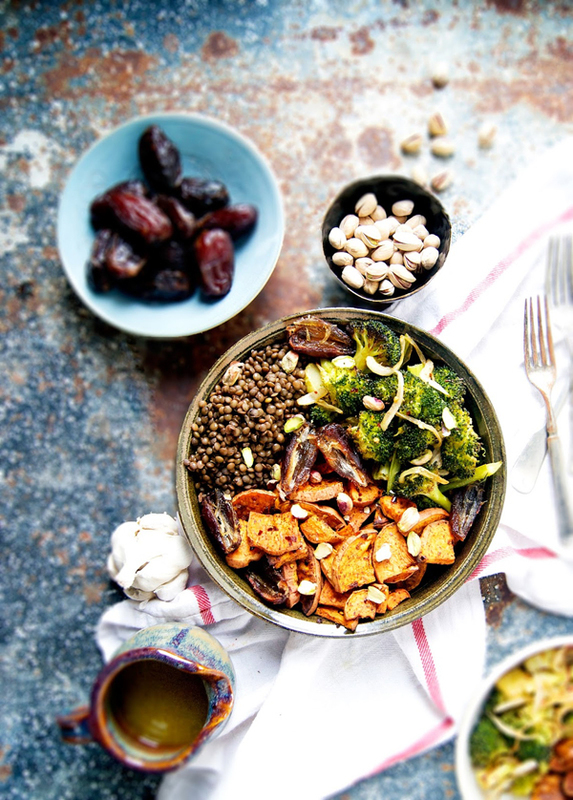 If you’re waiting for winter, this Buddha bowl is filled with winter produce – dates, roasted broccoli, lentils and sweet potato. The lemony garlic dressing is the perfect topping, too. 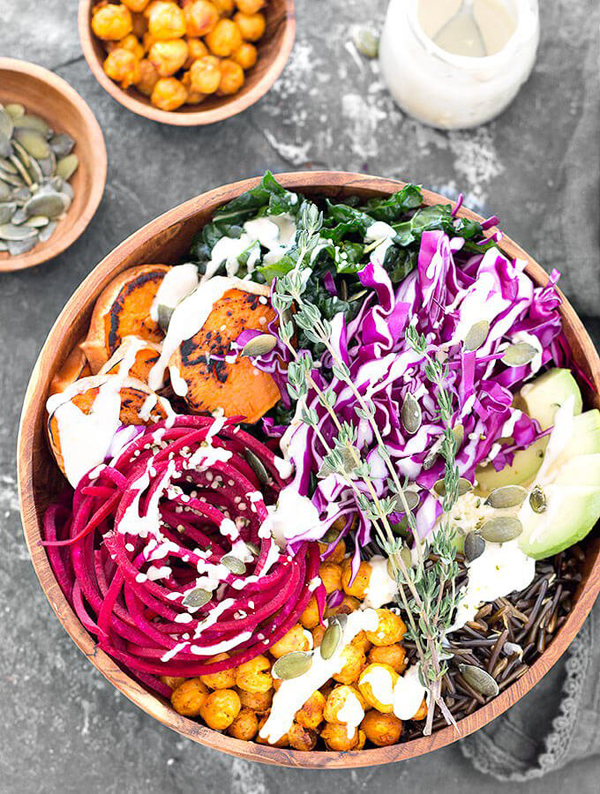 If you’re on a detox, this bowl will put a smile on your face. It’s healthy, varied and incredibly tasty, suitable for packed lunches and larger dinners. Who said dieting had to be a drag? Wow, what a combination of flavours and colours! You’ll certainly want to stick a photo of this on Instagram! Top with pumpkin and hemp seeds for a unique finishing touch. Combine fluffy quinoa, crispy spiced chickpeas and mixed greens in this fabulous recipe. Pour a red pepper sauce over the top to make it even better. This recipe serves two people. 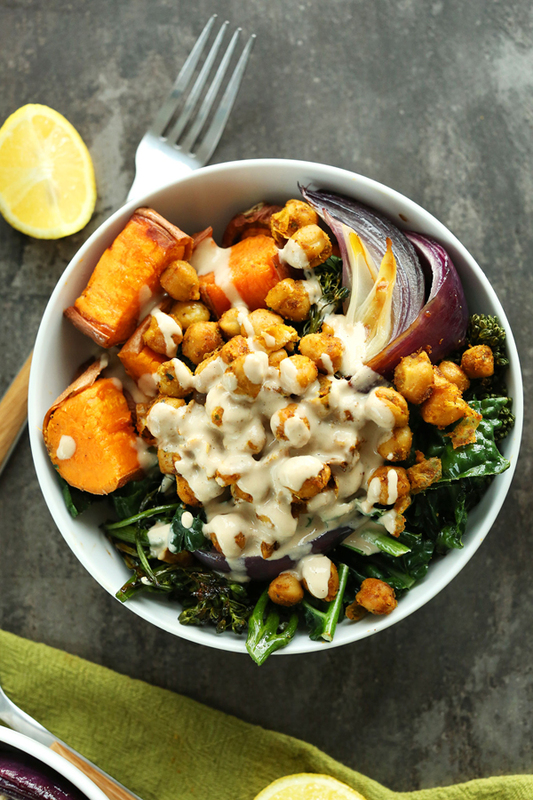 The spicy peanut dressing for this recipe can be made in a blender or mixed together in a bowl. It perfectly complements the fresh ingredients and quinoa. Definitely worth a try. 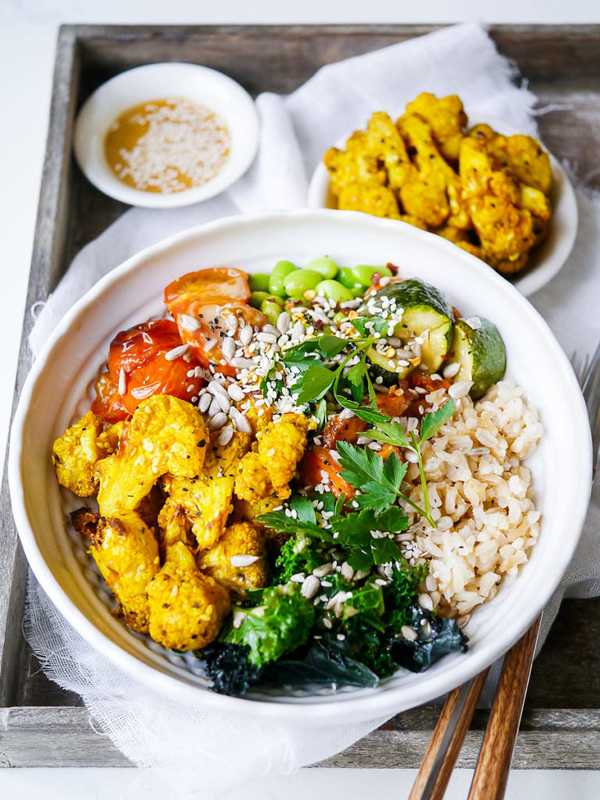 You’re sure to love the crispy edges and wonderful flavour of the roasted turmeric cauliflower. 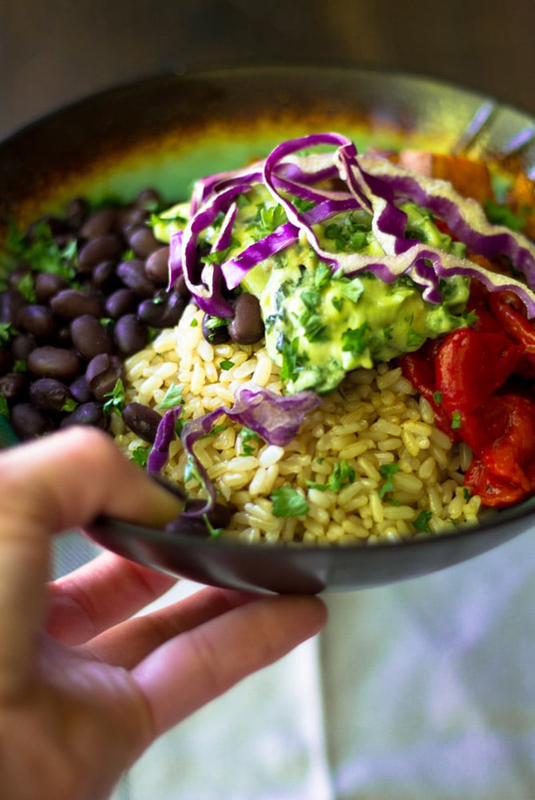 It’s the star of the this Buddha bowl by far (but the rest of it is great too)! This recipe comes with a lot of handy tips. One of our favourites is to prep the ingredients one evening, pack them into separate containers and then assemble them when you’re ready to eat. 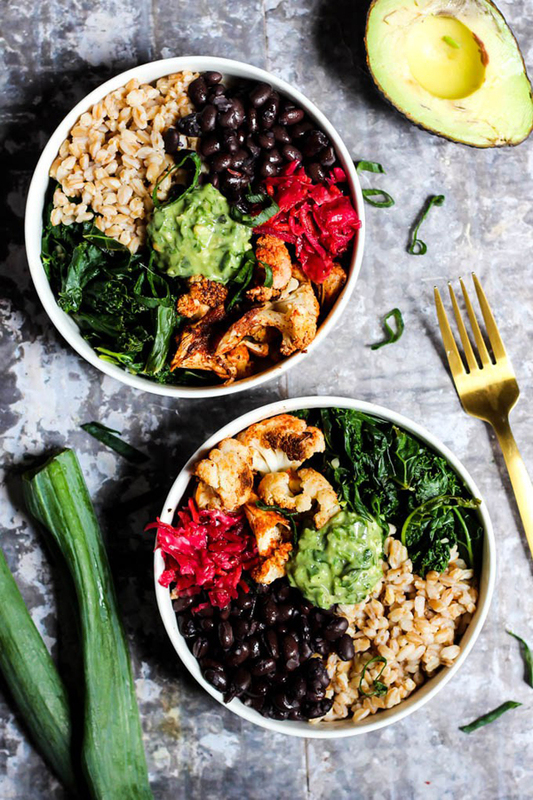 This Buddha bowl is almost too beautiful to eat (and the key word there is ‘almost’ as we definitely want to eat it)! The vegan falafel balances out the light flavours of the greens incredibly well. 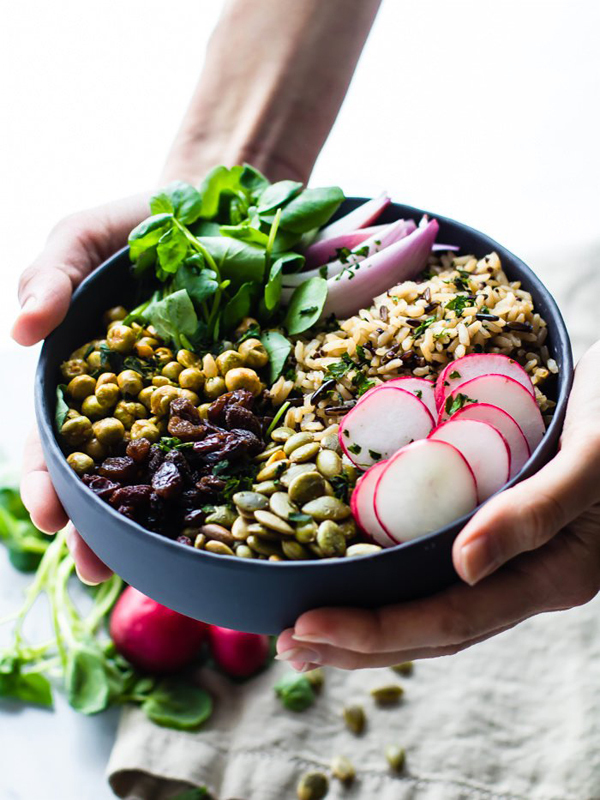 This recipe makes a good point – Buddha bowls are indeed effective ways to get a variety of nutrients into your diet. It’s nutrient dense, full of protein and contains loads of Vitamin K, which helps your brain. 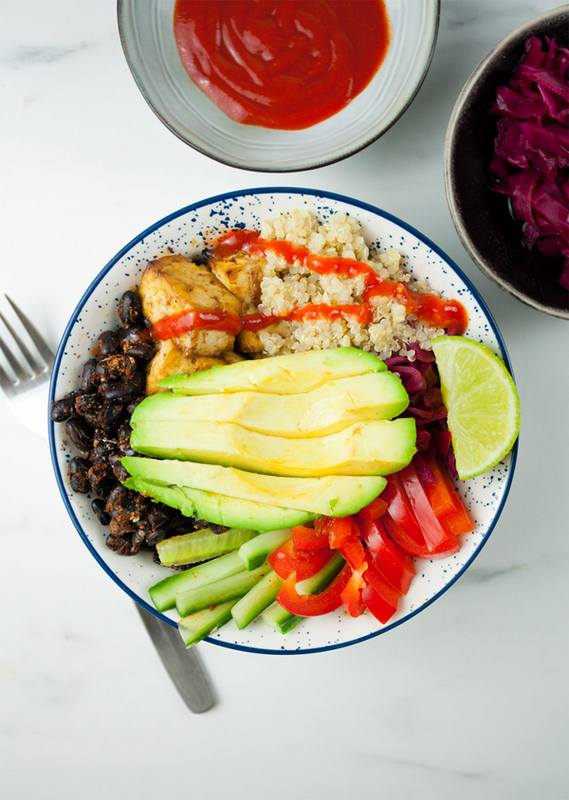 A recipe with a name like ‘Dragon Bowls’ needs to be impressive, and these delightful dishes do not disappoint! It looks incredible and gives you 100% of your daily Vitamin B12. 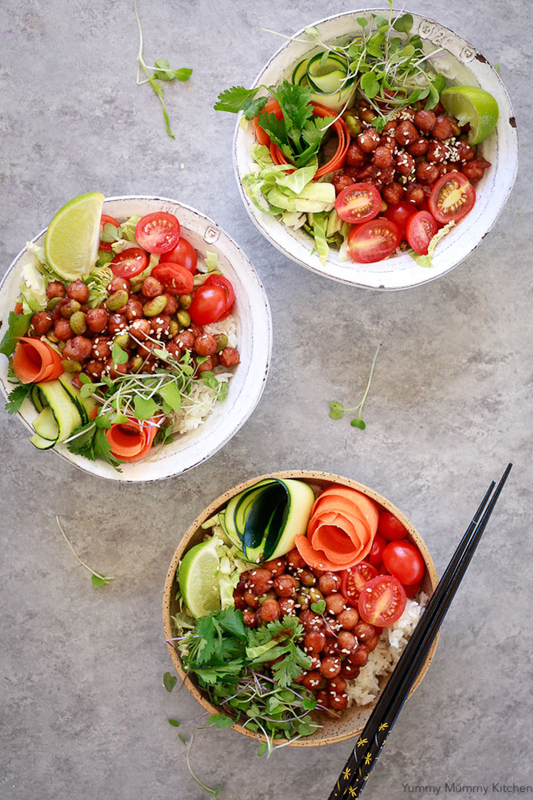 For a Korean take on the one-bowl trend, try this one, made with BBQ chickpeas, fresh vegetables and rice. To make the recipe vegan, be sure to swap out the honey for coconut sugar. 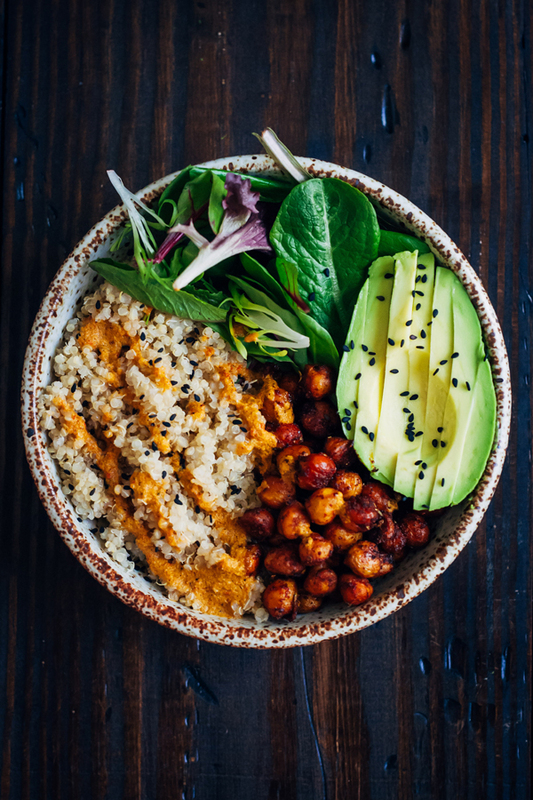 The crispy tofu in this recipe brings a meat-like element to your Buddha bowl. It’s great if you’re craving a heartier meal without the fuss of too much cooking time. Yes, the ingredients list for this one is long. However, by preparing the separate elements in advance you can refrigerate them and use them for numerous lunches and dinners. It’s a serious time saver. This recipe can be adapted and changed day-to-day as you buy new ingredients and feel the need to experiment. 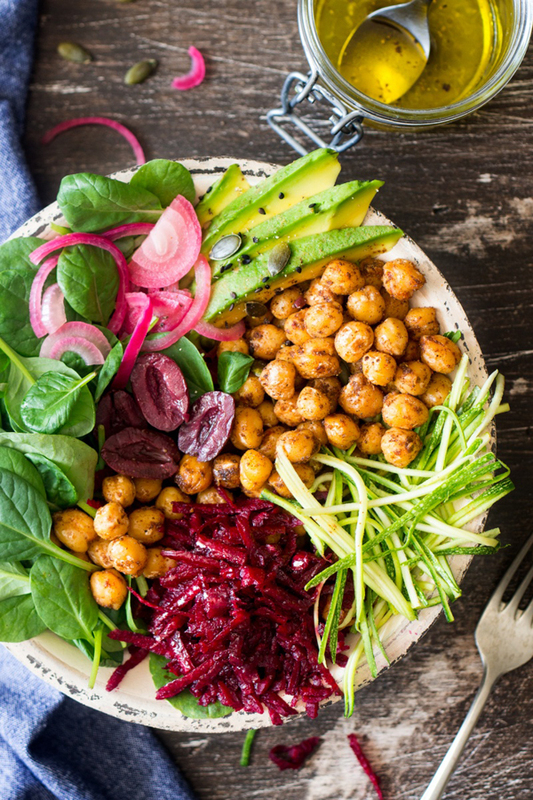 It’s a quick and healthy lunch idea that doesn’t get old and evolves with your tastes. The quinoa, black beans and tofu in this recipe are all full of protein. If you like a hint of spice, keep the chili powder in or, if you don’t, swap it out for something subtler. If you like tahini, you’ll love this one. 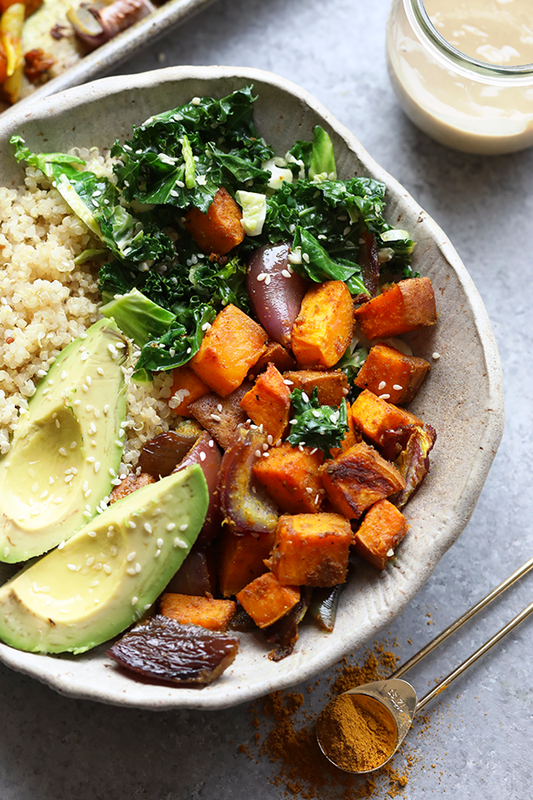 It’s a mixture of sweet potato, garlicky kale, quinoa and tahini. It’s ready in under and hour and is a good idea for a meal-prep lunch. 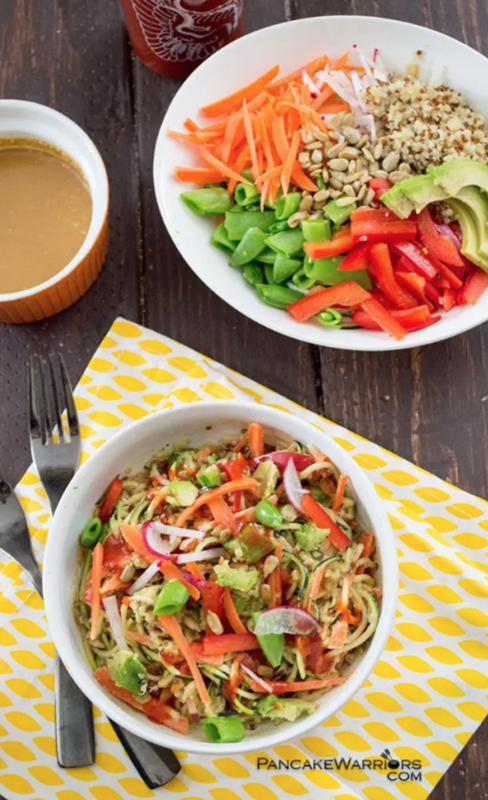 Fresh zucchini noodles, chopped veg, quinoa and sunflower seeds make up the base of this bowl, and it’s topped with an Asian-inspired peanut sauce you’re sure to love. If you’re after simplicity, this one is easy to make and still stacks up in the flavour department. You can throw in your favourite vegetables and health foods – whatever is lying around in your kitchen! 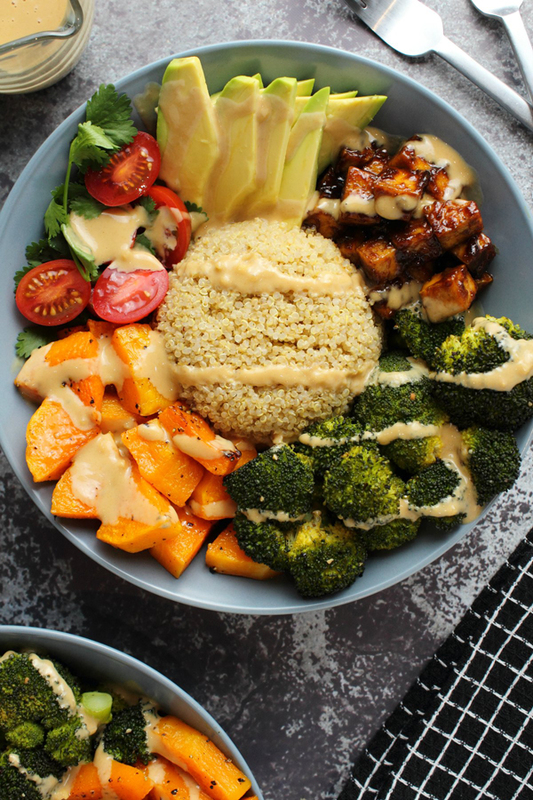 This recipe comes together in about 30 minutes, is full of nutritious foods and is finished with a drizzle of cashew curry sauce. It also contains 20 grams of plant-based protein!